In today's organizations, attacks come from everywhere. As cliche as it sounds, networks are borderless and because of this organizations face more sophisticated threats. As networks evolve, many organizations struggle to have intrusion prevention or other security architecture evolve at the same pace. Visibility is everything: you must be able to detect and respond to threats before they cause significant damage. The following entry is all about how to gain visibility at the different areas of the network. Wikipedia defines Intusion Prevention Systems as a "network security appliance that monitor network and/or system activities for malicious activity. The main functions of intrusion prevention systems are to identify malicious activity, log information about said activity, attempt to block/stop activity, and report activity." By deploying IPS, organizations are able to identify, classify, and stop malicious traffic, including worms, spyware / adware, network viruses, and application abuse before they affect business continuity. The most common place to insert IPS is at an organizations' internet border(s) and DMZ(s). 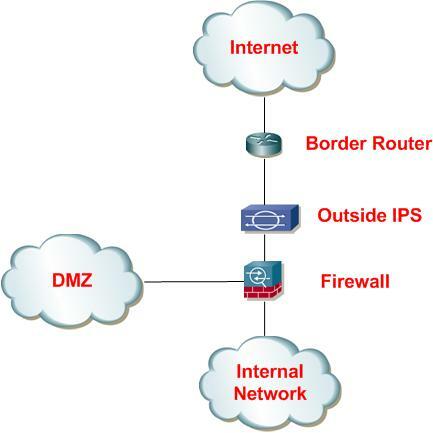 The following represents some of the options for placement of an IPS to protect an internet border and DMZ. This architecture places the IPS outside of the internet firewall.This architecture was one of the first proposed when IPS came to market, but is not very common for today's environments. Destination/Victims addresses will be NATed, causing research to determine which device inside the organization is being attacked. Source/Attacker addresses from the inside of the organization will be NATed causing additional research to track down the source of any malicious traffic coming from the organization. Inspection of traffic that will be dropped by the firewall will create excess false positives. This architecture places the IPS inside of the internet firewall protecting both the Internal Network and DMZ segments. Events will include real IP addresses and not NATed IPs. 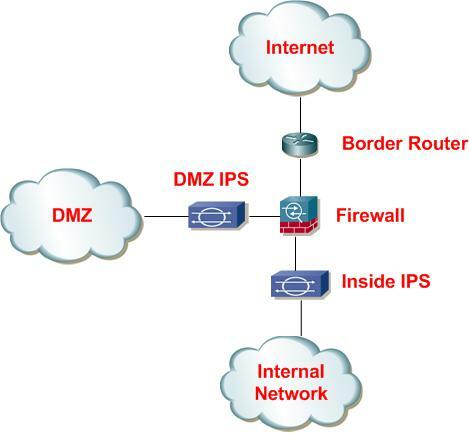 Differentiate traffic to/from DMZ and Internal Segments. Requires 2 IPSs or an IPS with enough interfaces to protect both segments. Traffic between internal and DMZ will be inspected twice. With the growing popularity of Unified Threat Management (UTM), this architecture is becoming extremely common. 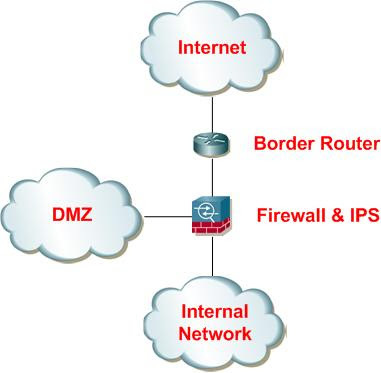 It places the IPS functionality inside the internet firewall protecting both the Internal Network and DMZ segments without a separate appliance. No additional appliance required, saving rack space and energy. One of the most important assets an organization has is its data. Most data is stored on servers located in a data center. This is why placing IPS between users and the data center is becoming a must have for organizations. Most designs will include placing the IPS at the most central point for the data center(typically distribution or core layers). The challenges faced when deploying IPS in data centers are making sure you keep the same levels of redundancy and throughput of the data center. This can be accomplished through using etherchannel load balancing of separate IPS Appliances. For more information on Cisco IPS in the Data Center with etherchannel load-balancing, please read Jamey Heary's blog post on the topic. Scalable bandwidth for all sizes of remote offices. Determining where IPSs should be placed in an enterprise is a must do task. A single IPS on the internet border leaves organizations with a hard outer shell and chewy inside. Hopefully this gives you some more details on the areas (Data Center & Remote Sites) that you should focus on. If you have additional questions, please feel free to email me. The opinions and information presented here are my PERSONAL views and not those of my employer. I am in no way an official spokesperson for my employer. Access Control is on the rise. A recent Gartner survey indicates that 50% of enterprises plan to implement 802.1X in their wired networks by 2011. Gartner believes that momentum will increase strongly, and that actual enterprise adoption will reach 70% by 2011. With that said, we have a lot of organizations evaluating the differences between Cisco NAC and Cisco 802.1X. Before we dive into the details of either solution, I thought it would be appropriate to compare the two. Cisco NAC Appliance (formerly Cisco Clean Access) was designed to use your organization's network infrastructure to enforce security policy compliance on all devices that attempt to gain access. You can use the Cisco NAC Appliance to authenticate, authorize, evaluate, and remediate wired, wireless, and remote users before they can access the network. NAC can be deployed using in-band(IB) or out-of-band(OOB) modes. OOB is typically used for LAN deployments, while IB is used for VPN/Wireless deployments. With IB, authentication is performed at the NAC Server by forcing traffic through the CAS. Traffic is forced through the cas using VLANs or Routing(PBR, VRF, etc.). Authorization (after the user goes through authentication and posture assessment) is performed through ACLs on the NAC Server. With OOB, authentication differs based on whether the user is Layer 2 or Layer 3 adjacent to the NAC Server. If the user is layer 2 adjacent, then VLANs are typically used and SNMP is used as the control plane to assign the appropriate VLAN. If the user is layer 3 adjacent to the NAC Server, SNMP will be used to assign VLANs, but authentication segmentation is typically performed by using ACLs or VRFs. Authorization is performed using dynamic VLAN assignment. Where can you go? - Based on authentication, the user is placed in the correct VLAN or a PBACL is used. What service level do you receive? - The user can be given a per-user access control list to explicitly restrict or allow access to specific resources on the network, or given specific QoS priority on the network. What are you doing? - Using the identity and location of the user, tracking and accounting can be better managed. During authentication, traditional 802.1X keeps the port in a down state until authentication has been performed. If the newly created "Open Mode" or "Low Impact" mode is being used a vlan or PBACL can be used to enforce access restrictions. For authorization, 802.1X uses VLANs or Port-Based ACLs(PBACLs) to enforce access-restrictions for devices. Policy can be different between the machine and user sessions. The switch acts as the enforcement point and uses RADIUS as a control plane with Cisco ACS. Above you should notice some major differences between the two access control methods, but I would like to take you a little deeper and call out some of the major differences. If you have a requirement of performing detailed posture assessment and remediation within the next 12 months than you must go with Cisco NAC Appliance. 802.1X does not perform posture and the two access control methods do not work together. One major question that comes up regarding posture is determining whether a device is owned or furnished by the organization. With NAC, you can perform Active-Directory SSO or check for specific files/registry keys to determine if it is an asset. With 802.1X you can use Machine Authentication using certificates to determine if the asset is owned by your organization. So even though you cannot perform posture assessments, you can check whether the devices is your by validating a certificate that is issued only to authorized machines. The use of ACS Servers vs. NAC Appliances is a major difference. The use of RADIUS vs. SNMP is another. Does it really matter? In most cases, NO it does not. In some cases, administrators prefer to use ACS because they are experts in using it. Some organizations "refuse" to install another agent onto their desktop, so having the option of running a supplicant that is native to the Operating System is a huge benefit of 802.1X. Cisco NAC Appliance has a list of OOB supported switches and the list is very comprehensive. This means there is less chance you will have to upgrade hardware or IOS. In order to take advantage of the newer features that make 802.1X very easy to deploy, the switch support for 802.1X is a little more demanding of recent versions of code. Cisco has innovated around easing deployment of 802.1X and because of this, Cisco Switches are recommended(Stay tuned to the blog for more posts around these features). NAC network changes include SNMP configuration, new VLAN configuration, VRF and/or ACL configuration. 802.1X requires a standard access port template on each port, AAA configuration, radius configuration and potentially ACL Configuration. NAC requires more initial configuration to perform authentication than 802.1X. With NAC cutover, authentication is a must on day 1 and posture is typically implemented in audit mode. If a user does not have a way of authenticating(no agent, not logged into domain, etc) the user would be stopped. With 802.1X cutover, open authentication allows administrators to deploy with zero worries day 1. If a user does not have a supplicant or the MAC is not configured for MAB, the switchport will remain open. The bottom line is that both deployments have their advantages. 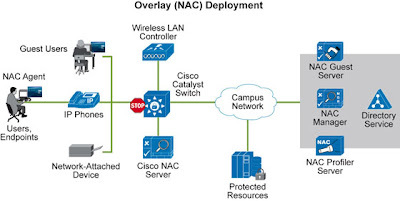 NACs ability to assess an endpoints compliance with policy and 802.1Xs ability to deploy day 1 without any headaches gives both options valid arguments. The real decision should be based on your environment.... Do you need posture? Do you have all 2900XLs? Can you install an Agent? One popular request is a list of features that come along with the different versions out. Below is a comparison of all the major code revisions of Cisco NAC Appliance. Today, organizations use IT to support their mission and business objectives. With the evolution of business through technology, organizations have proven that it can be an accelerator for growth, competitive differentiator, productivity enhancer and even strengthen employee satisfaction. The challenge organizations face is how to obtain these returns from the technology that they have invested in? Unlike the Cisco NAC blog, CAYSEC will expand to covering Cisco ASA, IPS, SIEM, 802.1X, IronPort S-Series and C-Series(Web and Email), and router/switch security. If you have comments/suggestions please contact me.